The beautifully-crafted Designo MX25AQ features a simple yet elegant 2015 iF Award-winning design. It has a sturdy metal stand with a stunning sundial-inspired base. 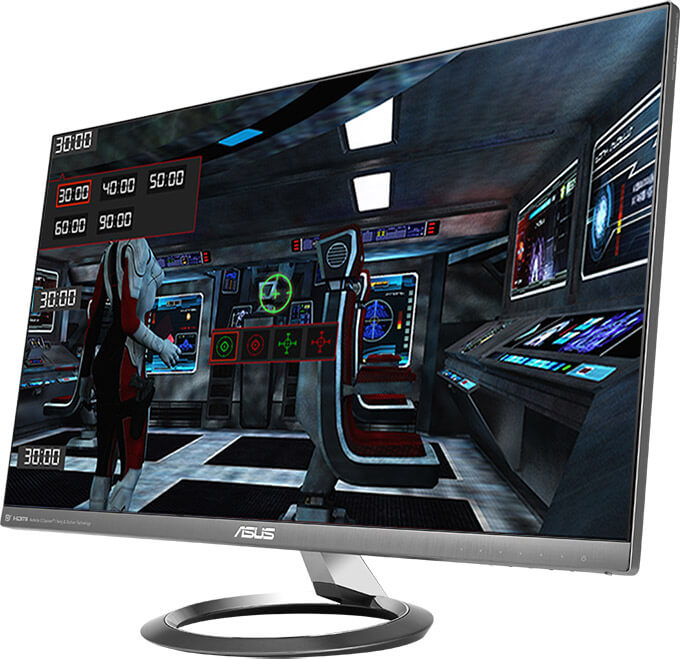 Prepare to be amazed as you experience exceptional 2560 x 1440 resolution visuals with the ASUS Designo MX25AQ. With its 25” WQHD display, MX25AQ gives you 25% sharper images and up to 77% more onscreen space than a similarly sized Full HD display – allowing you the freedom to spread out your various desktop windows. Designo MX25AQ features an advanced high performance in-plane switching (AH-IPS) panel to give you a stunning 100,000,000:1 contrast ratio and 178-degree wide viewing angles. The LED-backlit display also gives you extremely accurate color reproduction with 100% of sRGB color space – making MX25AQ ideal for professional-grade photo and video editing, or for home entertainment. ASUS Designo MX25AQ fully immerses you in awe-inspiring sound through a combination of advanced audio hardware and professional audio processing. MX25AQ features ASUS SonicMaster audio technology, co-developed with ICEpower®| Bang & Olufsen Technology. SonicMaster refines every acoustic detail to deliver crystal clear sound with richer, more distinct vocals and wide frequency range. The MX25AQ has an embedded ICEpower® |Bang & Olufsen Technology MobileSound 3 chip that delivers incredible audio fidelity through the two built-in 3W stereo speakers for rich, satisfying sound. MX25AQ features the exclusive ASUS AudioWizard OSD function, with four pre-set audio modes allowing you to tailor audio settings to suit the task at hand. Enhances in-game sound effects and vocals to add a new level of immersion to your gaming experience. Manual mode allowing you to customize your preferred audio settings. Say goodbye to tired, strained eyes. Designo MX25AQ features the TÜV Rheinland-certified ASUS Flicker-Free technology designed to reduce flicker for a comfortable viewing experience. This minimizes instances of eyestrain and other damaging effects when you spend long, countless hours in front of a display. Designo MX25AQ also comes with the TÜV Rheinland-certified ASUS Blue Light Filter to protect you from harmful blue light; a new OSD menu lets you easily access and select four different filter settings onscreen. MX25AQ has undergone stringent performance tests and is certified by TÜV Rheinland laboratories, a global provider of technical, safety, and certification services, to be flicker-free and to emit low blue light levels. Designo MX25AQ gives you unparalleled compatibility with most multimedia devices. It has a variety of video input options ranging from a DisplayPort1.2, dual HDMI, and a HDMI/MHL2.0 port. The latter lets you view content from your MHL-compatible devices* on the MX25AQ while simultaneously charging the mobile device. ASUS Splendid optimizes videos and images by enhancing color brightness, contrast, and sharpness. It include 8 preset modes (Reading , Darkroom, Scenery, Night View ,Theater, Game, sRGB and Standard) to suit whatever is currently onscreen. 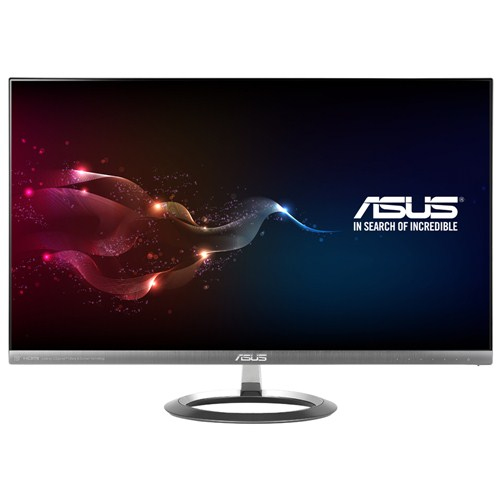 ASUS VividPixel Technology enhances image outlines and reduces noise bars, further adding to the Designo MX25AQ's crystal-clear, detailed visuals. Provides gamers crosshair and timer functions. Gamers can select four different crosshair types to suit the gaming environment; while the latter keeps players aware of the elapsed time in real-time strategy games.